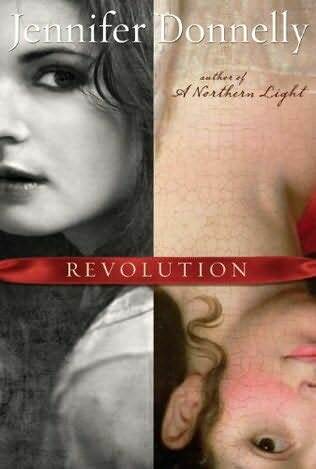 I almost didn’t end up reading Revolution at all. It turned up at my work a few weeks ago, and it kept drawing me in with that mysterious key on the cover. Then I’d pick it up, read the blurb, and go, oh, that’s right. One of those novels where a kid in present day times finds the diary of a kid from historical times and gains Insight and Perspective. I was already tired of that storyline when I was twelve. And I’d put it down again without starting it. But one day I was feeling impulsive, so I took Revolution on my lunchbreak with me. I figured I’d read the first chapter anyway. You know, just to see what it was like. And then I read the second chapter. And the third chapter. And the fourth. And then I bought it for myself and took it home with me so I could hurriedly read all the way to the end as quickly as possible. 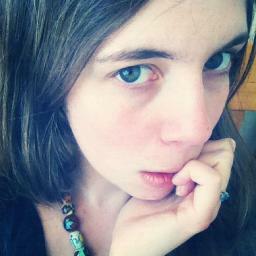 Basically: Andi lives in modern day New York, and blames herself for the death of her younger brother. Two years have passed since Truman died, but the aftershock of his death is still tearing Andi and her family apart. When Andi’s scientist father finds out she’s failing at her prestigious private school, he drags her off to Paris so she can catch up on her schoolwork while he carries out genetic tests on a heart preserved from the time of the French revolution, a heart which may or may not have belonged to the prince Louis-Charles. In Paris, Andi discovers a three hundred year old diary, which is where Alexandrine comes in. Alexandrine is Andi’s age and lives in 18th century Paris with her impoverished performer family during the time of the French revolution, and she finds herself caught up in the tragic story of the young prince Louis-Charles, heir to the throne. Louis-Charles ends up spending most of his childhood imprisoned under terrible conditions by French revolutionaries, and, like Andi’s younger brother Truman, Louis-Charles dies before he can ever grow up. This is one of many parallels between Andi and Alexandrine’s stories. The way their worlds mirror and converge makes me think of music, of two parts in a harmony running parallel but fitting perfectly together. Andi’s voice is spot on: she’s smart and snarky, and even though dead siblings are incredibly widespread in YA, Andi’s grief at losing Truman doesn’t feel like manufactured angst. It’s real, raw, and utterly believable. Her gradually unfolding romance with fellow music maker Virgil is beautiful. I particularly loved the scenes where they sing each other to sleep. Revolution clearly took a lot of research. There’s the French revolution, of course, but there’s also genetics, Andi’s father’s field of expertise, and music, the one remaining passion holding Andi together as the rest of her life disintegrates. Sometimes the dialogue is weighed down slightly by all the information it conveys, but generally, the facts were so fascinating that they seduced me as much as the plot. I probably even learnt more about the French revolution from reading Revolution than I learnt from visiting Paris a few years ago, and the discussions on music had me racing for my ipod to play Pink Floyd. A revolution can be large scale, violent and out of control, taking the city you thought you knew and transforming it into somewhere brutal and unfamiliar. But it can also be more subtle than that, taking place under your skin and changing who you are. Revolutions never truly end either, whatever their kind. The echoes of the revolution Alexandrine lived through are all through the modern Paris Andi explores. And Andi’s research on the groundbreaking eighteenth century composer Amadé Malherbeau shows how his revolutionary compositions changed music, creating influences can be traced right through to Radiohead. Revolution looks at how to survive in a country falling apart without falling apart yourself, and how to stay strong in a world where devastating acts of violence can happen any time. It is sad, romantic, and, ultimately, hopeful. And I am so, so glad I ended up reading it after all. 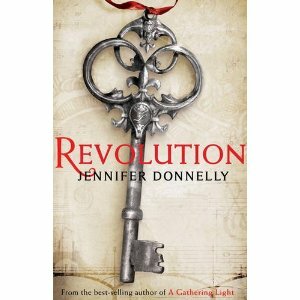 I was lucky enough to get an ARC of Revolution. I loved it too! I won an ARC of Revolution, too, but I haven't read it yet. This review makes me want to. beautiful review. I'm definitely excited to read this one. Gorgeous review. And I second what Kate said. I actually had someone recommend the book to me recently because they so loved the voice. It's on my tbr pile. Thank you for this wonderful review! You definitely encapsulated the most important aspects of this amazing novel. I had a hard time explaining why I loved this book so much in my review, but I think you hit the spot with your last line: "It is sad, romantic, and, ultimately, hopeful." You definitely have to read through times of intense depression and grief to get through to the hope in this book, but oh my, is it WORTH IT.